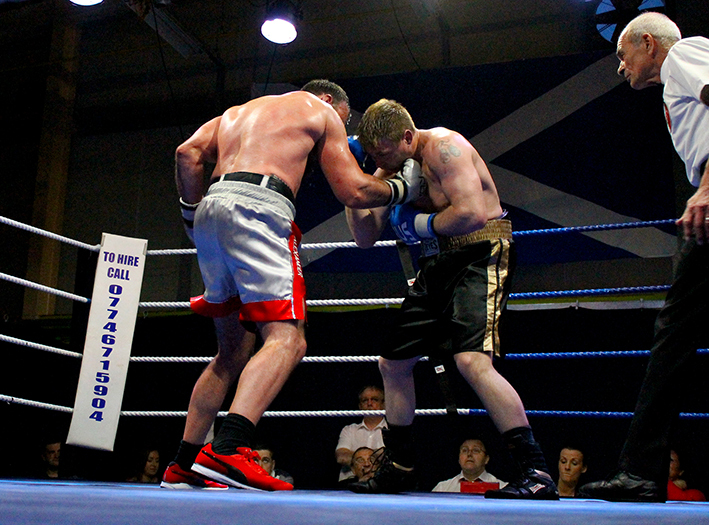 Well known Scottish WKA Kick Boxing promoter Stewart Allan promoted his first pro boxing event on Saturday night, at his Rivals Gym venue in Wishaw, and boy oh boy did he do a fantastic job of it. This was my first time north of the border for an event, I can promise it will not be my last. The venue was first class, the attending fans were highly vocal in their support of the boxers, not just the home boys either, as they enthusiastically showed their appreciation for each and every fighter. Mind you, as each bout was a equally matched Battle Royale, I suppose that shouldn’t have come as a surprise, let’s face it all boxing fans appreciate a really good close fought contest, which is just what we all got from every fight on Saturday night. 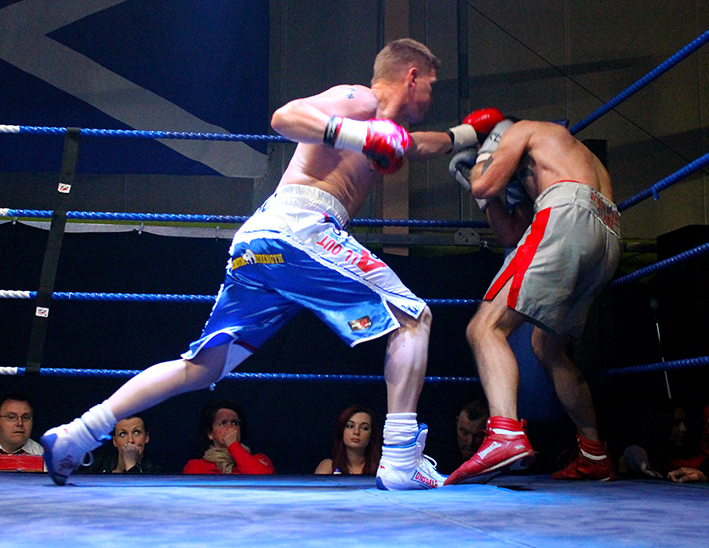 Heading up the show was Stewart’s son, unified Kick Boxing World Champion Sam Allan, making his pro boxing debut against unbeaten Chris Wood from Middlesbrough. The atmosphere was electric during the build up to this highly anticipated bout, I mean it was really bouncing, the fans were singing and cheering, then when the MC introduced Chris Wood they clapped and enthusiastically welcomed him into the ring. Then when the MC then introduced their man Sam Allan the decibel level went through the roof, I didn’t think they could be any louder but it did when Allan began his ring walk, escorted by two beautiful girls in full showgirl outfits, every single person stood and cheered their man into the ring. I couldn’t help but think at the time, I hope the fight is half as good as the pre fight build up, well it was, in fact it way exceeded any expectations. Right from the opening bell these two young warriors began the skirmish at a frenetic pace, Wood went in hard and fast, forcing Allan on to the back foot. With centre ground secured, Wood kicked up the pace even further, forcing Allan, with his back almost against the ropes, to rely on his excellent countering skills to keep the ever forward-moving Wood from coming in further. Wood secured the first round in my eyes, but it was close, very, very close, as these two really went for it for every second of the round. Round two was a virtual repeat, Wood initially controlling centre ground as Allan countered, however Allan stepped up the pace after about thirty seconds or so and made a double handed attack in an effort to force Wood on to the back foot, however the Teesider was having none of it and what ensued was an all action toe-to-toe slug fest through to the bell. The final couple of rounds were fought at an even higher pace, which resulted in control of the proceedings switching back and forth between the pair warriors throughout, much to delight of the fans ringside, who to a man, or woman, were on their feet egging their man on. After four sensational rounds the crowd remained standing as they awaited the judges scorecards to be read out. As Referee Mickey Vann stood waiting to raise the hand of the victor, the MC announced the result was a split decision, which nobody seemed surprised at, well it was a seriously close fight. First up Judge Kevin Scullion’s card was read as 40-38 in favour of Allan, which prompted a highly vocal response from the crowd, then judge Billy Beattie, who scored the bout 39-38 in favour of Wood, which received a good round of applause and then finally judge Peter McCafferty’s card was read, a surprising shutout 40-36 in favour of Allan, which sent the crowd into a joyful frenzy. Have to admit this bout was a true small hall classic, you don’t get to see fights like this that often that’s for sure. Congratulations to both Sam Allan and Chris Woods, these boys are genuine future stars, in some ways it’s a shame one had to lose, but then again that leaves it open for a rematch sometime in the future and if that does happen I’ll be there front row for sure as I wouldn’t miss it for the world. 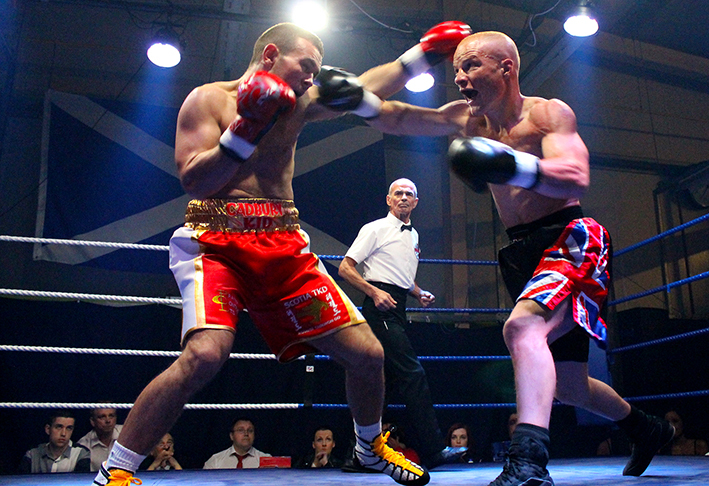 Prior to the sensational Allan-Wood, Ronnie Nailen faced Nottingham’s Matt Scriven in a four round exhibition bout. Another all action affair, which see both men going all out from start to finish, which is surprising as the bout was switched to a non-scoring exhibition bout, as Scriven has the opportunity to challenge for a title this coming weekend, as such it was decided not to risk a possible stoppage loss that would have cost him the title shot. Before the Nailen-Scriven bout was a brief interval, as an auction of boxing memorabilia to raise funds for charity took place. The second bout of the night featured Sandy Robb and Blackpool’s Matt Ellis battling it out in a six round Cruiserweight contest. Initially both boxers tentatively tested the other but after about thirty seconds or so stepped up the pace and really started to go for it. Initially it was Ellis forcing his way through Robb’s defenses with some solid jabs followed by big rights or neat combinations, however Robb is as savvy as they come and would often slip under the jab and let rip with a big left to the body. For about half the bout it was Ellis that was the more aggressive of the pair, don’t get me wrong, Robb was putting in some good solid work, just Ellis was livelier, moving neatly around the ring and throwing long rights at will, to back Robb toward the rope before going in hard to the body. However close in, even with his back to the ropes Robb seemed able to counter extremely effectively, in cases enough to make Ellis back off momentarily. Around the midway point the pace slowed slightly, which seemed to suit Robb, as the elusive Ellis became easier to close down, giving Robb the opportunity to once again start working the Blackpool man’s body. Referee Mickey Vann issued a number of warnings to both men, Robb for low blows and Ellis for holding, as each time they came close in Ellis would try and tie Robb up, whilst Robb would try to throw big lefts and rights to the body of Ellis, but many were a wee bit too low. After six highly entertaining rounds it was to the scorecards – Judge Kevin Scullion scored it 59-57 and both Billy Beattie and Peter McCafferty 58-57 all in favour of Sandy Robb. Have to admit I really liked this fight, for all the right reasons, they entertained, they worked at a high pace for a good amount of the time and put on one hell of a show. I do love the Cruiserweight division and both these guys are very much my kind of fighters – EXCITING - and I for one can’t wait to watch them in action again. The opening fight of the night see Mohammad Babazadeh take on Belfast’s Phil Townley in a four rounder. This pair set the tone for the whole night, both lads really went for it right from the opening bell. The younger Babazadeh set the pace, pushing forward at every opportunity, but Townley’s excellent countering on the back foot prevented the younger Babazadeh from being able to back him up to the ropes too often. As the bout progressed Townley slowed, which in itself made the bout even more exciting as the pair would stand toe-to-toe slugging it out much to the audiences delight. After four great rounds the judges scorecards unanimously read 40-36 in favour of Mohammad Babazadeh – without doubt the right result but doesn’t reflect just how close some of the rounds were or just how entertaining the bout was. There was due to be another bout, Scott Allan versus late replacement Garfield Mushore, who had stepped in at just two days notice after Isaac Quaye pulled out, however due to a rather large weight difference it was decided to cancel the bout for safety reasons, which was a mighty shame as I’ve been waiting to see both these lads in action. Congratulations to Stewart Allan and his team for putting on a first class, highly entertaining and memorable evening of boxing which I have to say I thoroughly enjoyed, I can’t wait to get back there for the next, which I have been reliably informed will be another Stewart Allan promoted event at the Rivals Gym on Saturday 27th June – so put that in your diary now as you’ll not want to miss it.